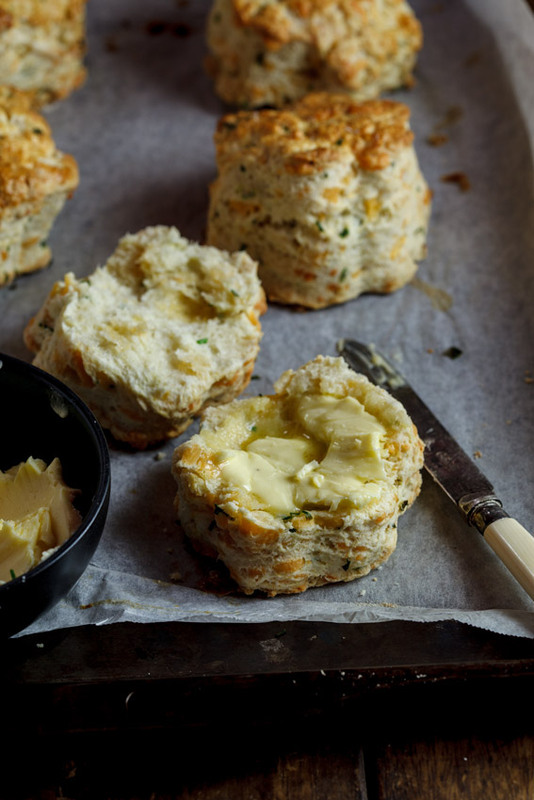 Flakey, flavourful cheese and chive scones are perfect for breakfast or brunch and makes a great savory addition to an afternoon tea table. They are pretty awesome lunchbox fillers too. 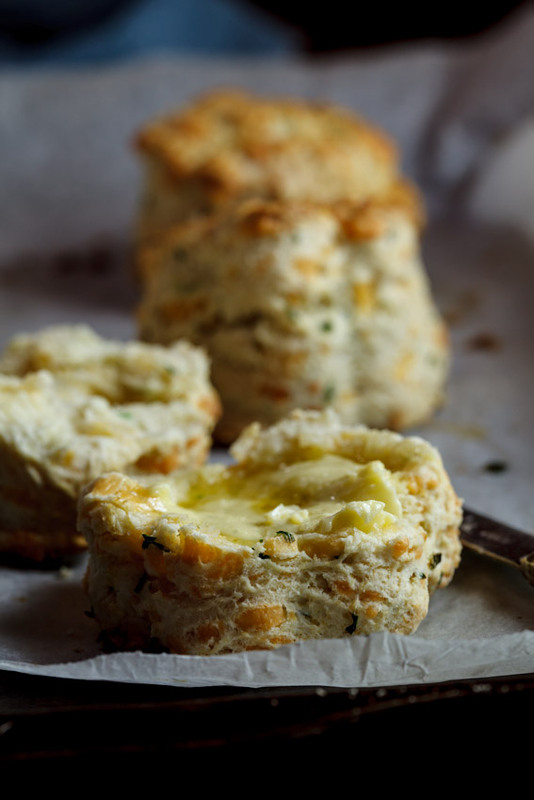 You break open one of these cheese and chive scones, a puff of steam escapes from the hot centre. You slather on a thick layer of butter which instantly melts into a golden puddle of goodness. 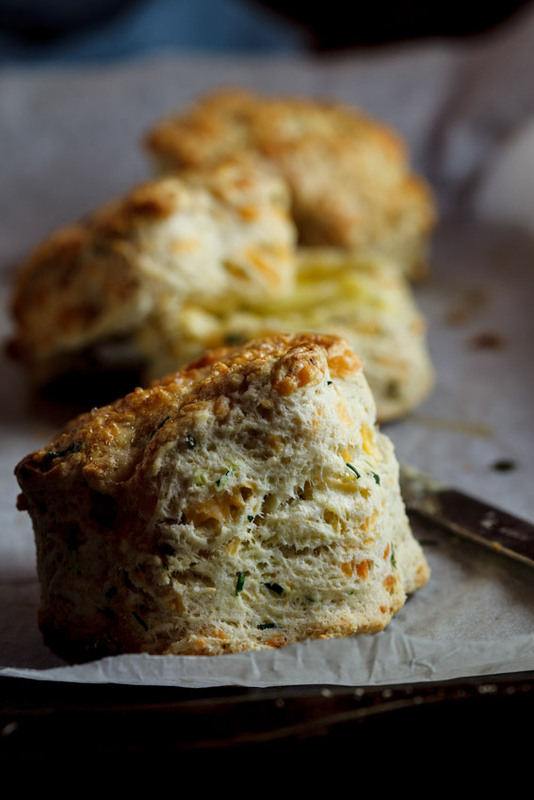 You lift the scone to your mouth but before you bite into it the rich smell of mature cheddar and chives makes your mouth water and then you take the first bite. Salty, rich, cheesy. The texture is flaky and light. You are now in food heaven. This was the experience I had when I baked these scones a while ago. It also now occurs to me that I should perhaps look into writing steamy novels. 50 shades of scones? Sign me up! This recipe comes from an ancient cookbook left to my grandmother by my great grandmoter, left to my mom by her mom and finally left to me by my mamma. The cover is off, there is no mention of a title or an author anywhere in the book but it is by far one of the most valuable possessions I own. 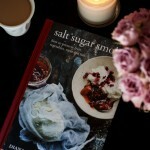 The recipes in there are written in old Afrikaans and ranges everything from baked goods to aspic to roasts and soups. It is absolutely the most used of all my cookbooks because there’s nothing fancy going on there. No intricate methods, no hard-to-find ingredients (except for the lard that is called upon instead of butter). 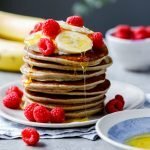 They are simple recipes that work. And work damn well. 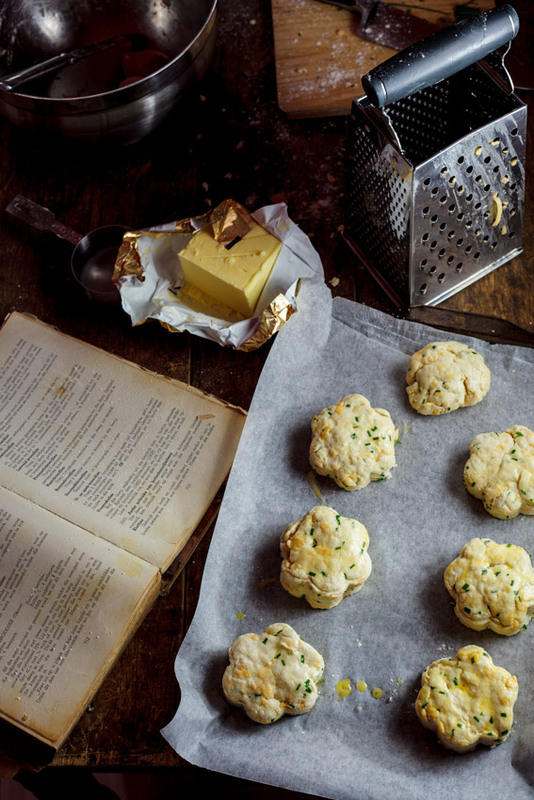 The cheese and chive scones recipe is one in particular I am obsessed with. On the day I made this savoury version I used the same recipe to make a delectable blueberry & almond scone (look out for the recipe next week) and it works every.single.time. 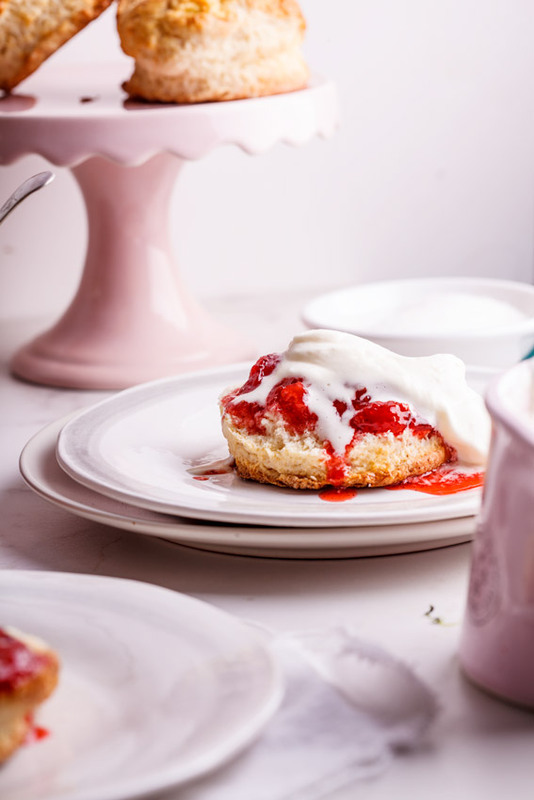 The scones rise beautifully, they are delicate and flaky and they taste great. They are also dead easy to make and requires only a mixing bowl and a measuring cup. The key to making super light and flaky scones is to not handle the dough too much. Using your fingers, rub the butter into the flour quickly before the heat of your hands melts the butter. Then, cut the milk into the dough with a knife before turning the dough out onto a floured surface and just ever so gently bringing it together. It might seem like the dough is under mixed but don’t be tempted to knead it. 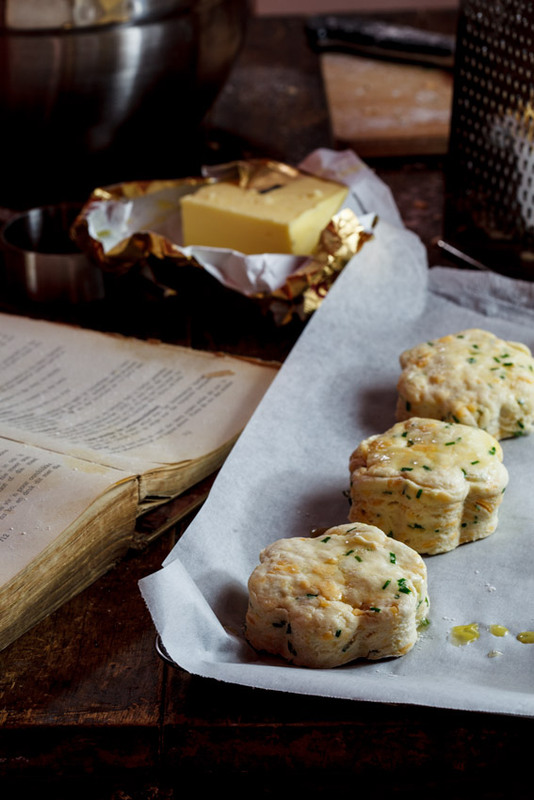 You want little lumps of butter in the dough which will release moisture when baking to create super light and flaky scones. A quick brush with milk and into the oven they go. 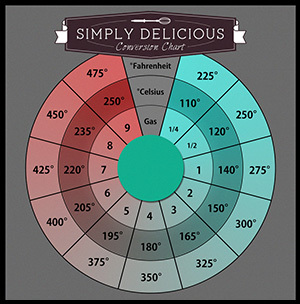 Your kitchen will fill with the scent of cheesy-chivey-baked goods deliciousness. But be patient because it will all be so worth it. 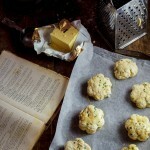 The scones will be golden and just begging to be slathered in butter. And that’s the food heaven I was talking about earlier. Enjoy! Pre-heat the oven to 180°c and line a baking sheet with baking paper. In a large mixing bowl, sift the flour, baking powder and salt together. Add the butter and with your fingertips, rub the butter into the flour until you have a mixture resembling coarse breadcrumbs. Add the cheese and chives and mix through. With a knife, cut the milk into the flour and butter mixture.until you have a soft dough. Turn the dough onto a floured surface and working very gently, bring together into a disc around 3-4cm in height. With a very sharp cookie cutter, cut out scones then place onto the lined baking tray. Bring the remainder of the dough together and repeat the cutting process until all the dough has been used. 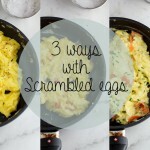 Whisk the egg then brush the tops of your scones and place in the oven. Bake for 15-20 minutes until the scones are risen and golden brown. Remove from the oven and serve with butter. 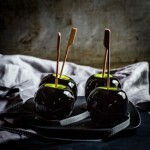 Easy question – I’m going to make these tonight. Can I make the batter ahead and bake off when dinner is about to be served or should I bake off and then reheat. I’m guessing reheat based on rising agent used. Thanks! You’re 100% correct Dana. I would rather re-heat them as the baking powder will start reacting as soon as the liquid is added. I hope you enjoy them! Oh my goodness, I’m entranced with the description of your great grandmothers cookbook. I have my great grandmothers recipe book and my grandmothers as well. 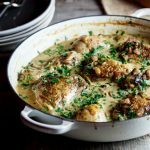 I love old recipes, they’re almost always practical and delicious. I hope you post lots of recipes from that book, old recipes sooth my soul. I swear they do! I love the height of these scones! They’re gorgeous!